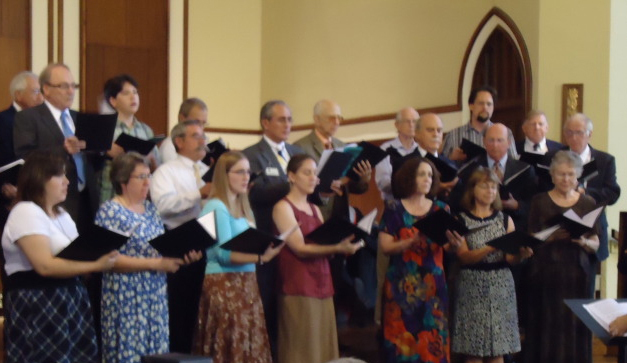 The Chancel Choir of University United Methodist Church provides special music during worship from September to May. We seek to present music of high quality and variety, while also enjoying fellowship - not to mention cookies every week! We laugh a lot, pray together, and support one another, and we love being in ministry together. Adults and high school students are welcome! No music reading experience is assumed. Joyful Noise is looking forward to a new season with lots of new music and fellowship. We are, however, in need of more hands at the tables. To ring bells with the group, you DO NOT need to have any prior experience with music, either playing an instrument or reading notes on a page. What you do need is a calm spirit and desire to make beautiful music. In order to facilitate the “calm spirit” portion of the list of qualifications for joining, Nicole Aldrich is ready and willing to give private lessons to bring anyone up to speed who may be interested in starting this fall. She will teach you all you need to know to get involved with the usual fun going on over on the west side of the sanctuary. If you have any interest at all, you can practice with her until you feel you’re able to join the group. There are all skill levels of ringing exhibited in the group. No judgment, just a lot of great music and team spirit going on with these awesome instruments. The Celebration Orchestra plays on special occasions in the life of the church, about two times a year. Rehearsals are on Sundays: the day of the performance and one week before. Adults and youth in eighth grade and up are welcome.